Another fantastic game drive to lake Manze. Just before we stopped for a picnic breakfast we saw a long and large queue of animals stopped and looking at the lake. I knew there was a predator around that’s why they had stopped. When we went near where they drink we saw one Lion and Lioness walking on the plain form the shade of a Terminalia tree to another and one lion was sitting in the shape of a Palm bush. We went near to the ones who where walking. This time they were already in the shade and as we were watching them the Male went to the female and started paying her attention and female got read for mating, we watch them mating for two actions. When we were watching them mating we saw big a herd of Wildebeest drinking on the other side of the lake. All of a sudden they started running away from the water quickly with a lot of dust. We decided to go and see what had happened. 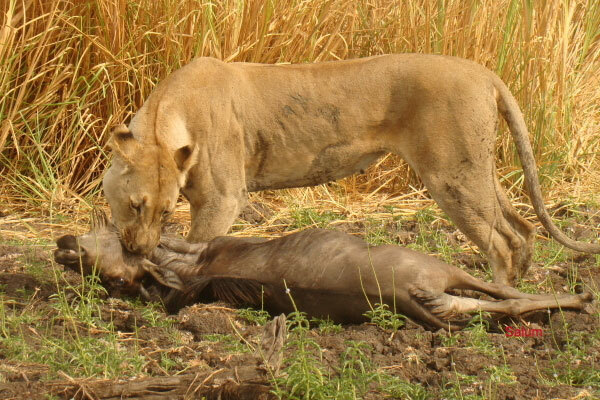 When we got there we saw the Lioness has just finished dropping a young Wildebeest. She seemed to chase a lot because she was breathing so hard. We watched her dragging it to the shade of the bushes. We waited for her to open it but she didn’t because she was tired. This entry was posted in Salum, Uncategorized, Wildlife and tagged Beho Beho, camp, kill, lions, safari, salum, selous. Bookmark the permalink.